The Loonie depreciated 8% against the Greenback over 2018, marking its worst annual performance in three years. The relative strength of the USD may however be turning as the USD lost ground against 27 of the 31 major currencies since the S&P 500’s recent low on December 24. On January 17, the Bank of Canada (“BoC”) opted to maintain its overnight lending rate at 1.75 per cent. In a statement released alongside the decision, the BoC struck a mildly dovish tone highlighting that developments in the energy sector and global trade tensions are weighing on the economy. As such, the BoC made substantial downward revisions to the growth outlook, from 2.1% to 1.7%. The BoC also caveated that future policy will be dependent on developments in oil markets, the Canadian housing market, and global trade policies. As at the date of publication, the currency pair was trading at 75.4 US¢/CAD. RBC is expecting the Loonie to retreat in the next few weeks, but then rebound later in the year as strength in non-energy sectors pave way to two more BoC interest rate hikes. Scotiabank opted to maintain its forecasts through to Q4 of 2020, adding that despite recent turbulence, it believes we are entering a period of slowing growth. Overall, surveyed banks generally anticipate the currency pair to remain near this level or appreciate relative to the USD. The forecasts for the month indicate the pair is expected to trade between 74.6 and 79.0 US¢/CAD by end of 2019, and between 76.0 and 81.0 US¢/CAD by end of 2020. The Eurozone suffered from political uncertainty in 2018, and Q3 results produced a disappointed GDP growth rate of 0.2%, it’s lowest pace since 2014 as noted by RBC. For 2019, Eurozone growth is set to decelerate to 1.6 per cent from 1.8 per cent in 2018, reflecting the pressure exerted by global trade war concerns and looming political uncertainties. European Central Bank (“ECB”) President Mario Draghi, spoke on January 15th at the plenary debate of the European Parliament regarding the ECB’s Annual Report 2017. Specifically, when asked if Europe was heading towards a recession, Mr. Draghi noted, “no, it’s a slowdown, which is not heading towards a recession, but it could be longer than was expected before”. Draghi added that a significant amount of monetary stimulus is still needed in order to support the further build-up of domestic price pressures and headline inflation. Surveying the banks, we observe a consensus that political risks in Europe, Brexit and trade policy uncertainty continue to be a common source of concern for the economy and dampen the value of the EUR. National notes that the ECB is unlikely to tighten monetary policy soon considering slow GDP growth, low inflation and a fragile banking sector. However, National highlights that investors should expect the ECB to eventually begin the normalization of policy rates which could help the EUR appreciate. BMO added that should economic activity in Europe pick up in the first half of 2019, a rate hike is likely in the last half of 2019; expectations that are generally in line with most of the surveyed banks. Overall, the surveyed banks are forecasting the EUR/CAD currency pair to trade anywhere between 60.8 and 65.0 EUR¢/CAD through the end of 2019. The BoC maintained its overnight rate at 1.75 per cent, expressing growing concern regarding the energy sector, volatile housing market, and uncertainties with the possible U.S.-China trade war. Despite the growing concerns, the surveyed banks still expect at least two rate hikes in 2019, with Scotiabank notably anticipating three. In the United States, at the December FOMC meeting, the Fed delivered an anticipated hike to the Fed Funds Rate, which largely drew a negative response from investors. Fed Chairman Powell took notice and was more cautious in January, striking a more dovish tone and noting a greater degree of uncertainty about future rate increases and reiterating the Fed’s willingness to be patient in raising rates should economic circumstances warrant as such. RBC believes that it will be difficult to see the Fed increase the overnight rate beyond 3 per cent (from a current target rate of 2.25 to 2.50 per cent), while Scotiabank and Desjardins forecast the rate to rise to 3.25 per cent by Q4 2019. 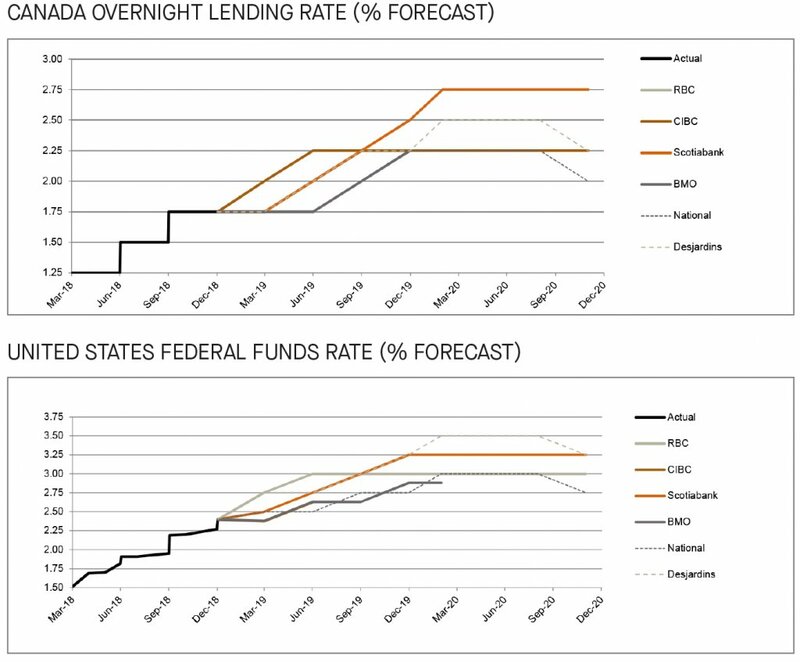 Since last months’ publication, downward adjustments were made by all the surveyed banks to both Canadian and the US yield forecasts which is unsurprising given the underwhelming recent economic data and rising political and fiscal uncertainties in both the U.S. and Canada. RBC attributes that a pick up in market volatility has caused a flight to safety with investors moving to government bonds and suppressing yields. Overall, the surveyed banks continue to expect that yields will continue to rise at least through to Q4 2019. 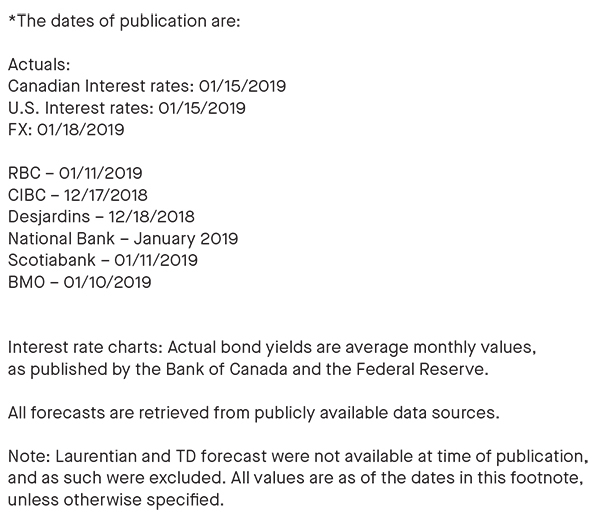 Thereafter, as 2-year bond yields peak in Q4 2019, the outlook is less certain as Scotiabank, National and CIBC anticipate these yields to decline through to Q4 2020. 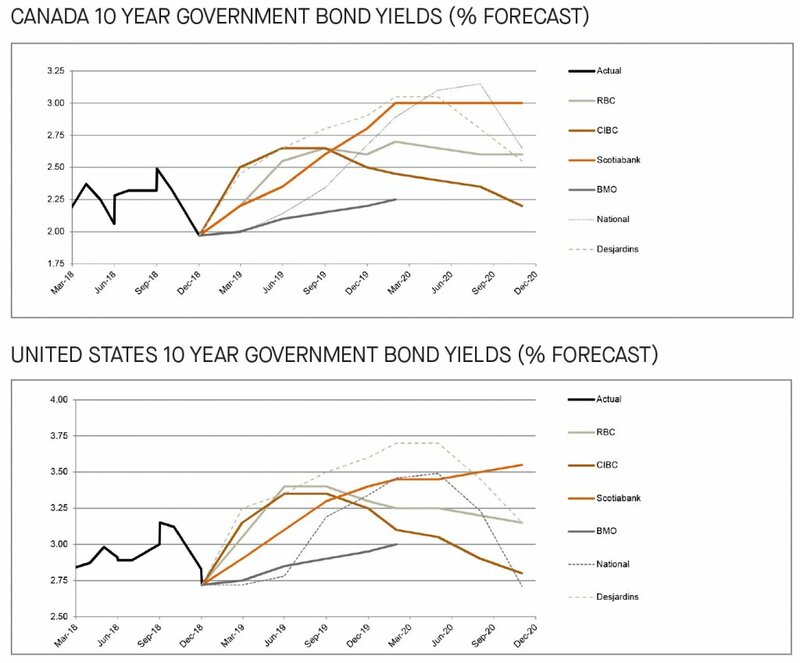 The surveyed banks have revised their forecasts down for both Canada’s and the U.S. 10-year government bond yields. National continues to believe that changes in borrowing requirements, improved economic conditions and further monetary normalization will ultimately push the U.S. 10-year yields higher, reaching 3.34% by Q4 2019. In Canada, National highlights that the yields will improve in the second half of the year due to stronger growth, rising inflation and further monetary policy. Overall, the surveyed banks are forecasting that through 2019, the 10-year government bond yields will rise to between 2.2% and 2.9% in Canada and 2.9% and 3.6% in the United States. However, the expectations remain tempered through 2020 as some reporting banks anticipate yields to drop indicating less economic confidence in the longer term. The long-term government bonds yielded 2.2% in Canada and 3.08% in the U.S. as of mid-January, respectively. 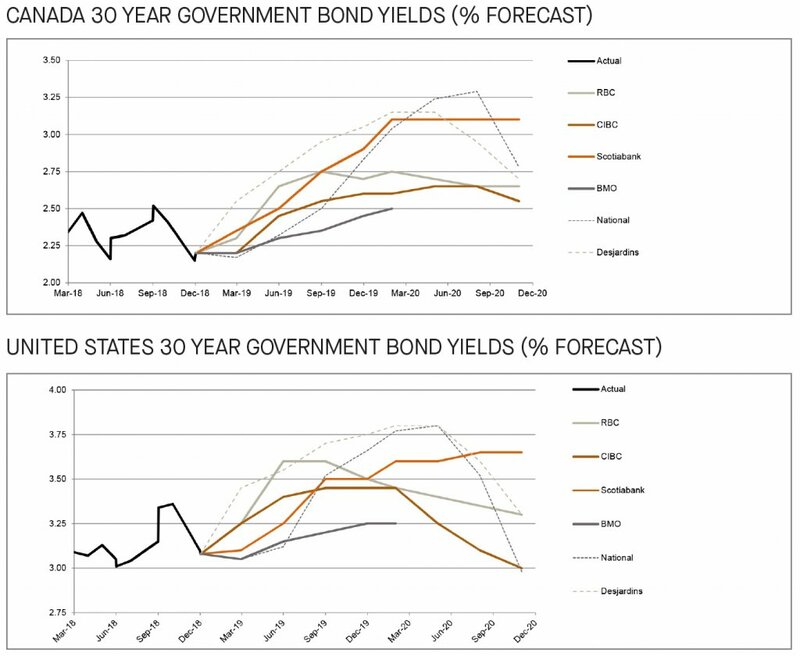 Since last month, we observe downward adjustments to the forecasts for the 30-year government bond yields. RBC attributes its downward projections in Canada due to the poor performance of the energy sector. Meanwhile, National is optimistic, anticipating the long bond yields in Canada to reach 2018 highs in Q4 2019, citing improved growth and rising inflation. 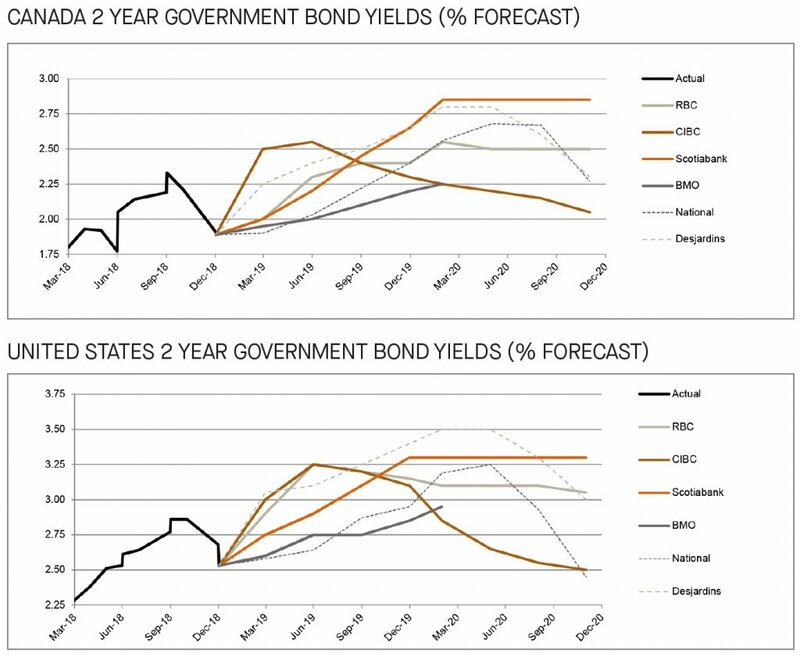 Overall, the rising yields trend for the long-term government bonds remains intact throughout 2019, forecasted to yield between 2.4% and 3% in Canada, and between 2.7% and 3.7% in the U.S. by Q4 2019. However, several banks are forecasting those yields to lower by the end of 2020, again signalling less economic confidence in the long term. The people behind the expertise.